Marigold (Calendula officinalis) Used for wounds, circulation, to balance the female reproductive system, for urinary, digestive and liver problems. It is a potent purifier of the body and gives good support to the lymphatic and immune system. The oldest and original medicine to restore balance and support health is the use of herbs. Paracelsus said that there is a healing plant for every disease. Fortunately, through my training, I gained this special knowledge that is no longer commonly available. 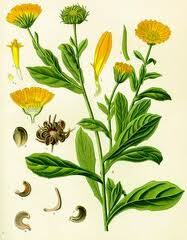 Nowadays herbalism is based on knowledge about the chemical ingredients as well as the traditional use of plants. Modern science is still discovering more and more about what the ancients have known all along, e.g. new research on medicinal mushrooms shows their amazing potency. Herbs can be used as tea mixtures and as oral or topical tinctures. The use of healing plants is an effective and natural way of treating diseases without side effects. Click here to book a free introduction phone consultation now.